Hey guys! Today I want to introduce you OKYALO, a brand that produces healthy and tasty aloe vera drinks. This company exists for 9 years. They are one of the best beverage manufacturers and exporters. They are supplying premium quality beverages to more than 30 countries. Their focus is on providing the best beverages like aloe vera drinks, coconut drinks, tea drinks, fruit juices etc. They want to bring the best food and beverages to the market and their goal is to make their drinks popular around the world. Now let's see what are aloe vera drinks, what are they made of, why are they so healthy etc. Well, aloe gel is found in aloe juice from aloe's leaves. Aloe drink is made from fresh aloe vera, sugar, citric acid, calcium lactate, vitamin C and so on. This drink can provide our body with amino acids, minerals, vitamins, etc. It has many healthy benefits. Thanks to a high concentration of vitamins, minerals and amino acids, it is an amazing natural cleaner. Also, it makes your immunity stronger, reduces cholesterol and blood sugar. By drinking aloe vera gel drink, you can rejuvenate yourself from the inside out. Cleanse your body daily by drinking some in the morning. You can drink aloe vera juice on its own, or feel free to use it in your smoothies instead of water for a more powerful healthful punch to start off your day. 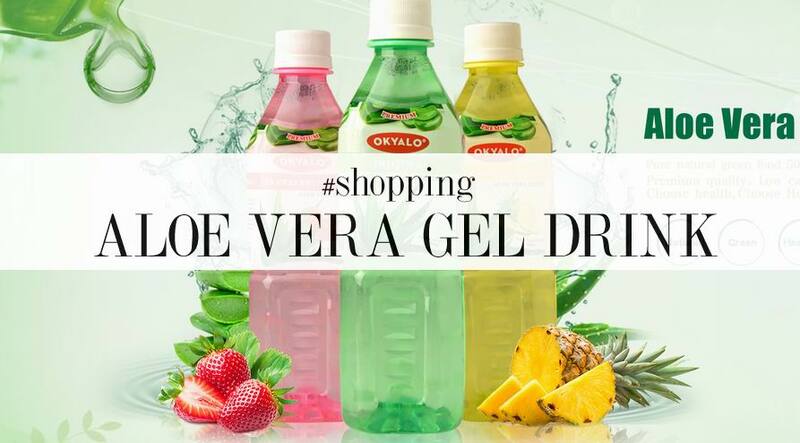 Aloe Vera drink by OKYALO is totally natural, of premium quality and with low calories. It comes in various flavors such as natural aloe flavor, strawberry flavor, coconut flavor, pomegranate, mango, pineapple, etc. Pineapple is a good choice! They have high quality pineapple aloe vera juice. It's made of 30% fresh aloe vera pulps and gel. There's no any powder, no preservatives, no GMO, no artificial flavor and no artificial color. That is truly important! Aloe drink with pineapple provides not only unique taste but also unique sensations with the freshest magically suspended aloe vera pulp. As I mentioned, there are many other flavors available too. What's your favorite aloe drink from Okyalo?